Jack's Camp is an oasis of style and comfort in the middle of Botswana's Kalahari Desert. The Makgadikgadi is truly like nowhere else on earth. Spectacular vistas, creative surprises, expert guiding, incredibly friendly habituated meerkats, unique desert wildlife, old-world safari styling and superb cuisine all come together to create an experience that is completely different to any other. 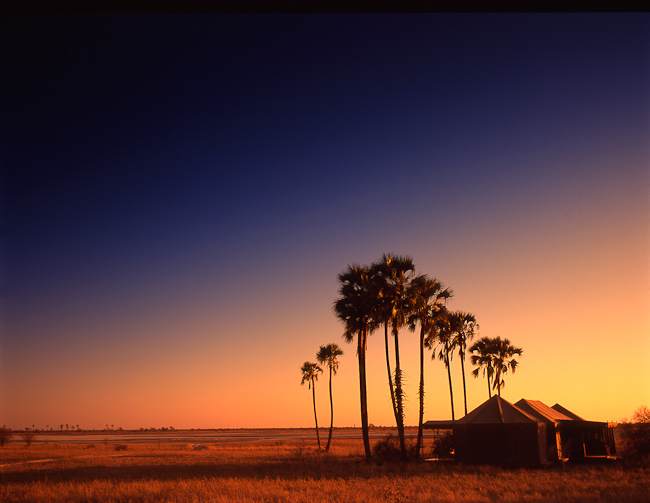 Jack's is a Kalahari Desert camp located in Botswana's Makgadikgadi Salt Pans. The remnants of an enormous superlake – that used to cover most of Southern Africa. Jack's Camp was originally established in the 1960s by the late Jack Bousfield, who lived there for many years preceding his unfortunate death in an aircraft accident. The camp has been completely refurbished in a traditional East African 1940s safari style. Authentic, but comfortable and stylish, including many thoughtful and unique details…. Roomy, classically styled tents with private bucket showers and flush loos are set into a palm grove creating an oasis of civilization in what can be the harshest of stark environments. A visit to the area is essential for anyone interested in evolution and the origins and explanation of the Okavango Delta and Botswana’s big picture. It is also a complete desert experience focusing on species unique to the area such as Gemsbok, Brown Hyena and Springbok, as well as the geology, archaeology and anthropology of the Kalahari and Makgadikgadi. Jack's are the only places where guests are practically guaranteed to see the rare and elusive Brown Hyena in the whole of Africa. Jack's Camp is a classic desert safari camp accommodating 16 guest in 7 Twin and 3 double tents with en-suite bathrooms featuring indoor and outdoor showers. Spacious and stylish – with a sophisticated 1940's safari atmosphere. Facilities include a mess tent with Natural History Museum, Library, antique pool table and well stocked drinks chest. Refresing swimming pool housed in a beautiful tent with deck and deck chairs. The wet season is generally from late November through March and into April. Activities during the wet season include game drives in open 4x4 vehicles custom designed for the terrain to experience the enormous herds of the annual Zebra and Wildebeest migration. Bird walks to observe migratory waterfowl (flamingos, storks, Wattled crane, ducks, terns, etc.) and their breeding and feeding sites are another option. Depending on the amount of recent rainfall, guests will have usage of 4WD quad bikes and vehicles on the salt pans, an exhilarating way to see the area. Night drives to view migration and unique desert wildlife (Brown Hyena, Aardvark, Aardwolf etc) are a special favorite. Game walks with Bushman trackers to observe the desert wildlife such as Gemsbok, Meerkat, and Springbok are a great way to learn how the indigenous San people survive in this seemingly inhospitable land. Finally, a visit to the historic Baobab Trees are always on the agenda (the campsites of Livingstone, Selous and Baines). The dry season accommodates much more extensive use of the quad bikes out on the pans. All other activities are available as well. The camps also operate a 5-day fly camp option to Kubu Island (weather permitting) with quad bikes for parties with at least four guests. The five day minimum is a set itinerary, spending two nights/one day in Jack's or San Camp in traditional but comfortable safari tents experiencing the surrounding area. Take game drives into the Makgadikgadi National Park to learn how the Kalahari Desert was formed as well as how the unique desert species are adapted to living in this sometimes extremely harsh environment. These activities are conducted in luxuriously appointed customized Land cruisers, or on foot with a Bushman Tracker. On the morning of your second day in camp, depart on the quad bikes across the main pan en-route to Kubu Island. The journey to and from Kubu is extremely interesting as it includes a very ancient defence fortification which was only discovered three years ago. The next two days/two nights are spent exploring Kubu Island and the surrounding area. The last night will be spent back at either Jack or San Camp depending on how bookings are in either camp. Kubu itself, a granite extrusion island studded with baobabs, is of course one of the most graphically beautiful spots in Botswana and is full of intriguing detail, such as ancient walling and European trade and Bushman beads. It is also close to what is probably the biggest greater and lesser flamingo breeding site in the world. 30,000 flamingo fledge there when water is good and although the mud mound nests are deserted at the times of the year when we are able to visit Kubu, they are still very interesting to visit. Many chicks are left to die if they hatch too late to be able to join the incredible march across the Pans that the young flamingos undertake in search of water. Their remains lie on the pan surface almost petrified by the salt. Unhatched eggs also remain in some of the thousands of abandoned nests. While in this fascinating area, you will have the opportunity to visit the extinct mouth of the Zambezi which together with various other rivers, once flowed into the Pans. The remaining beach is covered with beautiful water-worn pebbles amongst which you can find semi- precious stones such as garnets and cornelians. Accommodation is in canvas bedrolls which are laid out under the stars. There are no dangerous animals as such and as the Makgadikgadi is one of the most perfect places to stargaze, a starry sky makes the perfect ceiling! Hot showers and a long-drop loo are provided, and delicious meals are served on damask tablecloths set with bone-handled silver as in Jack or San Camp. On the morning of your last day, you depart from Kubu, once again setting off across the Pans on the quad bikes to reach Jack's or San Camp in time for tea. The most important aspect of these trips is that it gives us a chance to truly understand the Pans, how they were formed as well as the history, both 'recent' (ie. Livingstone etc.) as well as stone age. You will experience a sense of true adventure, active involvement as well as the sense of space that can only be felt upon reaching your destination after driving across white pans with absolutely nothing else in sight for several hours! The Pans are the size of Switzerland, a fact that is difficult for many to comprehend. This trip goes some way towards explaining the many mysteries of this fascinating and still very much unknown area.